Explore the natural and social characteristics of the Daintree catchment in this interactive story map. 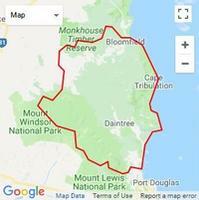 Additional useful information about the Daintree Catchment can be accessed through Queensland Government’s WetlandInfo site. Find interactive mapping, NRM data and the widest range of wetland management resources in Queensland. Daintree – where ‘the rainforest meets the reef’. Boasting exceptional natural beauty and untamed wilderness, the awe-inspiring Daintree landscape has remained largely untouched by development. It is a living museum, celebrating the region’s extraordinary diversity of plant life and wildlife. Two World Heritage Areas – the Wet Tropics Rainforest and the Great Barrier Reef – sit uniquely and spectacularly side by side. Together, they provide the basis for the Daintree’s tourism industry. With access to the Daintree restricted to either a cable ferry across the Daintree River, or a 4wd traverse along a remote track, it is a memorable experience just getting there. However, it is definitely worth it. Visit the Daintree and enter a world of extraordinary beauty, providing an opportunity for “wilderness living” rarely seen in our developed coastal areas. Rainforest-clad mountains sweep down to long sandy beaches, fringed with the increasingly rare littoral, or beachside, rainforest. The Daintree rainforests are amongst the oldest in the world. In fact, many plant species are true relicts of the Gondwanan age and provide an insight into the evolution of flowering plants. Refuge from the ice age has been provided in the cloudy wet mountaintops and deep moist valleys for many life forms during their evolutionary history. Many of the survivors have changed very little since those ice-age ancestors. 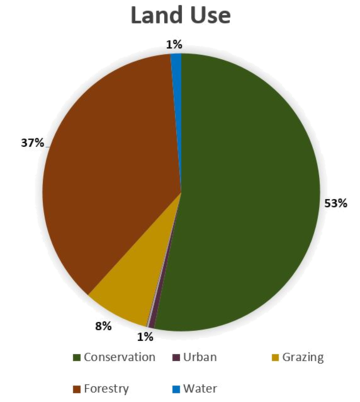 Other more recent arrivals from Asia have created a unique and diverse blend of plants and animals. Over half of the Daintree Local Landscape is within the Wet Tropics World Heritage Area, teeming with more wildlife than almost any other place on the planet. 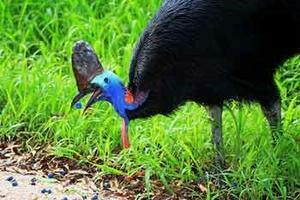 Stately Southern Cassowaries, now endangered, still have a stronghold in the Daintree. Their substantial droppings, full of large rainforest seeds, are scattered throughout the forest. They provide an important role in forest regeneration. With many nocturnal wildlife residents, dusk and dawn come alive as the night and day shifts swap. Rainforest ringtail possums are masters of the canopy at night. Swirls of Australian Swiftlets dart above the canopy in the early morning light, catching insects. Tiny brilliant Azure Kingfishers dive into shallow pools from overhanging branches to feed on fish and small crustaceans. Sitting quietly in the rainforest can be an almost spiritual experience. You can be enveloped and overwhelmed by infinite shades of green, broken only by brief, yet spectacular, splashes of vibrant colour, as jewel-like butterflies flutter by. A powerful landscape, areas like the Roaring Meg Falls show the true intensity of nature in this environment. A special place to local Aboriginal people for thousands of years, the falls are now only accessible to four wheel drivers along the iconic Creb track. Communities of the Daintree Local Landscape are highly diverse and adaptable… many locals are deservedly proud of their unique lifestyle and reckon there is not another place like the Daintree on earth! Small townships, nestled amongst the towering forests, are home to creative, resilient communities, who share their homes and backyards with a remarkable diversity of plants and animals. Although gold miners, explorers, timber-cutters and farmers have all made their mark on the area, the natural landscape is one of the least modified in the Wet Tropics. Locals these days enjoy a remote lifestyle. Some small scale agriculture and low-impact tourism provide the economic backbone of the area. The dense rainforests were originally home to Aboriginal people, who gathered seasonal food bounties from within the forest. The Wet Tropics remains the home of a rich and enduring Aboriginal cultural heritage. There are at least 17 Traditional Owner groups made up of more than 20,000 Rainforest Aboriginal people. Click on the Local Cultural Connections link for more information on the Traditional Owner groups and history for this Local Landscape.